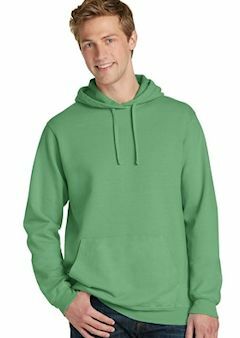 Custom Embroidered Pigment Dyed Sweatshirts, Full Zip, 1/4 Zip, Hooded and Crew. Custom embroidered pigment dyed sweatshirts in basic crew, full zip hooded, 1/4 zip and hoodies are quite trendy and nice to throw on when it's a big cold and you want something unique. Unusual color choices make this a stand out anywhere! Add your custom embroidered logo on any styles or ask about our imprinting as well. You just can't beat a nicely done custom embroidered pigment dyed sweatshirt. Brands include Authentic Pigment dyed. 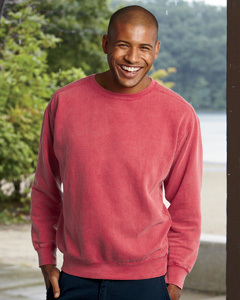 With aged-to-perfection color, this soft, comfortable sweatshirt is essential and authentic. 8-ounce, 80/20 ring spun cotton/poly fleece The pigment-dying process infuses each garment with unique character. Please allow for slight color variation. Special consideration must also be taken when printing white ink on pigment-dyed cotton. Custom embroidered logo included. 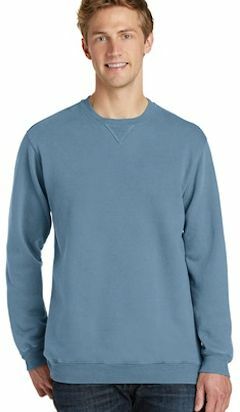 Custom embroidered 1566 Comfort Colors Garment-Dyed Fleece Crew Sweatshirt. 9.5 oz., 80% ringspun cotton, 20% polyester; preshrunk, soft-washed, garment-dyed fabric; set-in sleeves; sideseamed body; forward rolled shoulder; 1x1 rib on collar, cuffs and relaxed waistband; double-needle stitched. Custom embroidered logo included.